Judas Priest really hit the mass market with the album British Steel, but before then they were building a loyal, almost cult, following with their truly unique sound. This album was a live album that was the culmination of that era of the band, and directly preceded British Steel. It still holds up as one of the strongest 1970's era metal live albums, although the production by today's standards seems a little flat. The only other complaint is that it is a shame the American release (the version reviewed here) was only a single disc set. Still, the band truly proved that they were a metal power that was ready to break loose. This was the glory days of the Priest, and I for one miss those days. Having seen them several times in that era, though, this album brings it all back. It is highly recommended for all fans of the original type of heavy metal - "true metal". Starting with what sounds like the same harmonic chord used in the intro to Yes' "Roundabout", as this ends and the song begins it is with what deceptively sounds like a finale. However, as that winds through the band rips out into a frantic rocker that comes across here a bit raw and ratehr quirky. It is the old school metal world at its finest. Never really a favorite of mine, this one is not a bad song, but it just doesn't stand out. Still, it is one of the earliest of Priest's anthemic pieces, and it does rock. Besides, there is that cool inimitable old JP guitar sound present, and the guitars leading up to the outro are very tasty, if a little noodly. Coming in with whirling, echoey, screeching guitars, the rhythm section enters and this Judas Priest classic is on its way. In its early segments it is a rather straightforward, somewhat raw, old school metal cut. Halford is really the piece that gives this section its magic. The bursts of guitar soloing at the ends of various lines of vocals later serves to intensify the charm of the piece. As it moves into the slower segment later, the guitar sounds lend a tone that is hard to pin down, part psychedelic, part space rock, but all killer Priest metal. After this slower, quite powerful segment, a quirky riffing segue pulls us back into the earlier sections of the piece for a chorus. After that the band just sets out to shred for the remainder! At 7 ½ minutes in length, this truly is a mini-epic, and nu metal bands could learn a lot from listening to this. Looking to early (pre-Buckingham/Nicks) Fleetwood Mac, this is a cover that certainly surpasses the original. 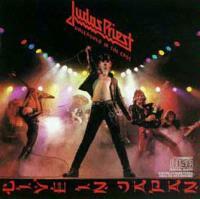 This rocker was trademark Priest, and Halford's high-pitched vocal excursion on the outro is nearly unparalleled. The dueling guitar solo is just one other thing that makes this such a killer, must have track. If Fleetwood Mac was odd as metal cover territory, Joan Baez is nearly incomprehensible. Priest truly makes this their own. Although certainly well written, JP really breathes new life into it. Some parts of this cut lean towards the mediocre, but the "sin after sin, I have endured…" slower segment is truly magic and elevates the whole piece. The live version here is quite strong, and although different in texture than the studio take, certainly is an equal to it. This is another winner. Never one of my favorite Priest number, this one does have a lot of energy and vitality, particularly in this form.